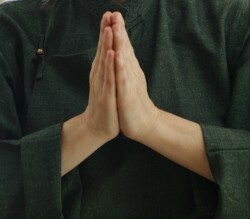 The 8 treasures is a unique Chi Kung (also known as Qi Gong) style that was formally organized around 2,000 years ago and was transmitted by the Ni Family through an unbroken succession of 74 generations of Taoist masters. The form is comprised of 32 movements arranged in 8 sections. These movements combine toning and strengthening, stretching and breathing techniques for the purpose of maintaining health and preventing disease. The Eight Treasures Qi Gong form is based on the natural motion of the planets and stars as well as on the simplicity and power of Mother Nature. As our bodies are a small model of Nature, by focusing on maintaining a smooth flow of Qi (Chi) in our bodies, our small universe can begin to attune to the greater rhythms of the Universe, thus creating health. As you deepen your practice, you may also redirect the flow of vitality so that every muscle, nerve and organ is nourished and tonified…this will definitely make you look and feel more vital! I have learned the 8 treasures from a student of the Ni family. I would like to know where I can become certified to teach? I am also interested in your classes. Hello Thea. My apologies for the late response, I was out of town with no internet connection. I am a Senior instructor, which means that I can certify you in the 8 Treasures 1,2 and 3. You can follow the below link for more info about the the certification process (if you haven’t done so already). Please, feel free to call me or e mail me with more questions if needed.